Whoever recommended using a bicycle pump to blow out eggs for crafters, let me know so I can buy you a beverage of your preference. [Edit: going through some older comments, it was Risa who suggested the bike pump method. Thank you, thank you, thank you!] Eggs were blown out in seconds instead of lung-busting minutes. This is fantastic! Thank you! Now onto a completely unrelated note: If you're worried about the H1N1 flu, first things first: don't panic. Here's a great page from our U.S. Government on how to prepare your household and family for a pandemic: PandemicFlu.Gov . [If you use homeopathic remedies, check out this great document from the National Center for Homeopathy.] Today I stocked up on the over-the-counter pharmacy remedies that work well for Spouse and myself, such as real Sudafed (have to ask the pharmacist for it, d@mn you methheads), and Mucinex. When preparing for things like this, remember to purchase items that you'll use regardless of event - that way, you'll use up what you buy eventually, and it won't go to waste. I've been told that I have unreasonably high expectations of myself. This is another one of those instances where I feel I fell miserably short, where perhaps I should be looking at it as a good start instead. I didn't cook a CSA veggie every day (as the beets and kohlrabi will attest), but I did cook & eat more than I would have without the challenge. Regardless, the chickens will be getting a feast of last week's leftovers for the next few days, as I had to pick up today's latest CSA bag. Oof. One thing I need to do differently: come up with the recipes, write down the necessary ingredients, and then get them all during the weekly grocery run. Otherwise, I get lazy (although I tell myself I'm saving gas and the environment). 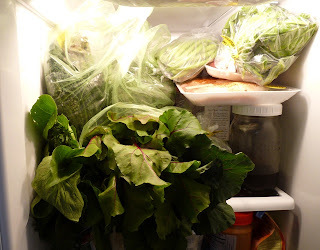 I won't update every day about what I do or don't cook/eat, but will summarize on CSA Wednesdays. 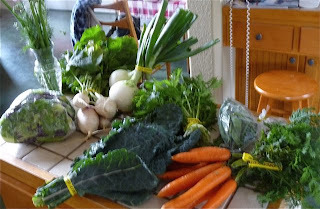 This particular batch of CSA bounty should be easier than last week's, as there's more that I usually eat. Onwards & upwards! "I think a lot of us have in our heads the idea that putting up food, or getting into the garden has to wait until we have time. But of course, that time rarely arrives." Check the link provided for a deeper explanation of what the challenges mean. 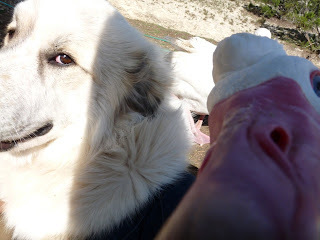 I'll probably blog my updates on Sunday afternoon or evening. If you've been wanting to become more self-sufficient, this is a great way to start! Oh, and Greens update: made the carrot-raisin salad. It was meh. Ate most of it, however. "What's an olla?" 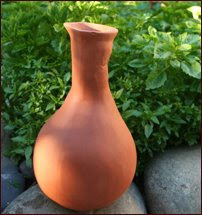 An olla (pronounced "oy-yah") is a terra-cotta bottle or pumpkin shaped pot. Ollas used for watering are buried neck-deep into soil, and then filled with water and capped. Plants near the olla will soak up the water that the terra cotta releases slowly. Gardening with ollas saves water, and plants love the slow, constant soaking at their roots. Ollas were brought to the U.S. Southwest by Spanish settlers, and the locals took up the practice of watering with ollas as well. As drought conditions worsen in some parts of the U.S. (including where we live), watering with ollas would be a good way to help conserve this precious resource. If I can't afford to purchase them outright, I plan to try making my own for the garden beds this Fall. Santa Fe Master Gardeners Assoc. Oleanders. Precious hates them, yesss she does*. I grew up in an area where the county planted miles of oleanders in a dismal attempt to beautify treeless, long, dusty two-lane "highways". Oleanders remind me of those roads, where the soil alongside was so alkaline it turned white in patches, and summers hot and bone dry. Besides being hardy, oleanders are also poisonous, which is probably why the county planted them - less chance of wildlife eating them. With these memories in mind, my goal this Spring was to tear out the lone oleander - planted by the previous owner - that resides in the eastern garden bed. It wasn't blooming anyways, and I wanted it gone on general principle. But then, behold: this week it bloomed for the first time. Hot pink blossoms. I hadn't seen oleander flowers of that color close up before, and I'll admit it, I've been entranced. So the oleander gets to stay until I order a shipment of rabbit-eye bushes (blueberries that grow well in Texas). Then hot pink flowers or not, that poisonous little biddy goes. Greens check in: made a (non-CSA) kale soup with chicken broth and rice noodles, then put together a carrot raisin salad using yogurt and agave syrup. Letting the flavors meld in the refrigerator, and will try it out tomorrow. 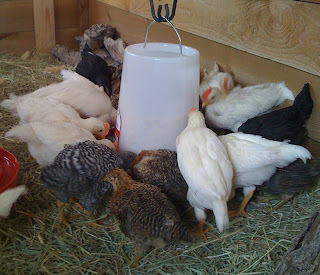 The chicks kept knocking over their metal feeder, and pooping in the water. Excitable girls! Spouse decided it was time to get a hanging feeder and water container, so off we went to Tractor Supply and picked up the new "dishes". 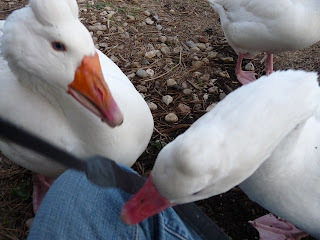 Once we got the food and water set up, the feeder was mobbed for a good five minutes - you'd think we'd never fed the little feathered fuzzballs. Gotta raise the watering jug, however, as they're somehow still managing to poop in the water. Greens: had spinach with supper last night (sauteed in about a Tb of butter and a little salt, with a handful of pine nuts). Did not use any of the CSA produce today; instead, steamed up some broccoli. Tomorrow I'll get the ingredients for the kohlrabi slaw. Later that night, ate some of the carrots dipped into a fresh jalapeño and cilantro-spiced hummos. Whew, quite a kick that hummos had, but also quite tasty! Went to bed later that evening feeling quite smug about my progress. This morning, gently microwaved some of the spinach, and made an omelet with our backyard chicken eggs, the spinach, some garlic powder, and romano cheese. Lunch was only an apple and peanut butter, so no CSA produce there. Dinner tonight: this should be interesting. Spouse comes home around 7:00 PM, and I'm not sure if he'll want to head out, or cook something here at home. Although I've already made my quota for using produce (at least one meal a day), meals with Spouse is where the rubber meets the road. He's definitely a starch and protien guy, and prefers to do the cooking. I'm lazy, so I tend to let him. He likes spinach okay, so he may make spinach with butter, lemon and pine nuts. 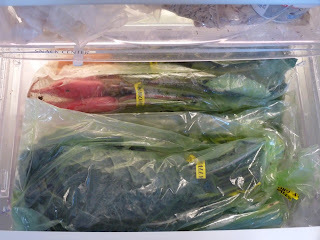 I may go ahead and make the kohlrabi slaw, and perhaps a carrot-raisin salad to munch on during the weekend. Will keep folks posted. 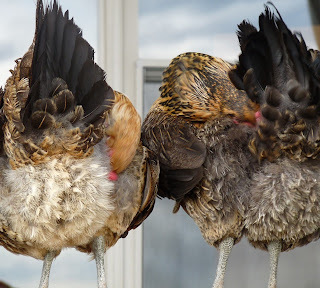 or give it up to the chickens and/or compost pile. Noooooo!!! Leek & potato soup, or baked leeks with Parmesan cheese. Radishes - raw, with butter & salt. Roasted kohlrabi, or kohlrabi & apple slaw. Sauteed mustard greens with Romano cheese. To keep me honest in this goal, I'll post every day with what I've managed to conjure up. Feel free to make suggestions on your favorite recipes as well... please. I beg of you! "They're the modern equivalent of duct tape and baling wire", says Spouse. 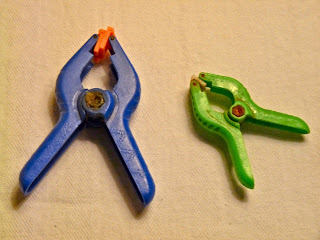 These plastic spring clamps, bought at Harbor Freight (I swear, I'm not a paid shill!) are relied upon for many, many things here at the Farm Natters abode. They hold up shade cloths, hold down tarps and blankets, hold closed feed bags, and hold together my sanity. 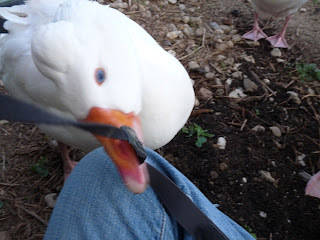 They connect temporary fencing to temporary fence posts (no more need for zip ties or wire), and we even use them indoors for closing chip bags. For temporary attachments and many re-uses, these little babies are darn near worth their weight in gold. Raised Beds? New Chick Digs! The two raised-bed forms - 12-inches high by 8-feet long by 4-feet wide - have sat in the yard, empty, since I made them last year. I still hope to use them for garden beds when the Fall growing season arrives, but for now? 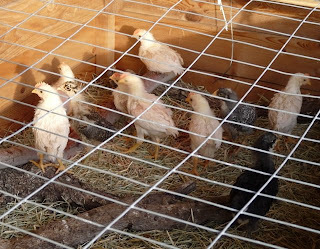 They've been re-purposed into a palatial home on the front porch for the fast-growing chicks. We stacked the two forms on top of each other, and secured with a couple of short 2x4's pieces of scrap lumber. The bottom and a few inches of the sides are lined with a tarp. 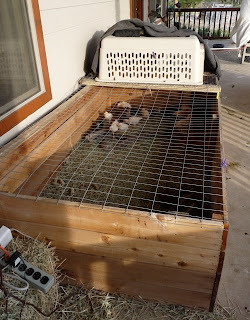 The far corner has been outfitted with the top of their original kennel, and its ceiling-affixed heat lamp is getting an assist from a second heat lamp (the evenings still get a bit chilly here). The whole thing is covered at night with two wool moving blankets ($6 each at Harbor Freight, fantastic deal! ), and keeps the chicks warm and protected from the evening wind. I usually keep the wool blanket covering the kennel side during the day, but pulled it back for a better pic of the setup. The covered end has their food, water, and a variety of branches to perch upon. 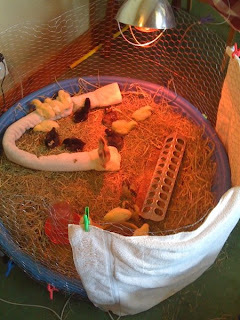 The open end has more branches, and a shallow box of dry dirt for dust baths. Several inches of hay line the inside, and the top of the box is covered with fencing to keep the chicks in, and everyone else out. We're hoping the new digs buy us a few extra weeks before having to start building a new coop. 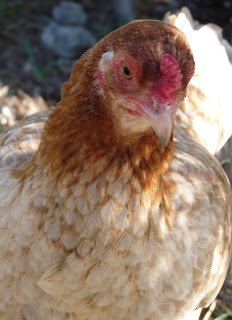 Got some great ideas from last week's Austin Funky Chicken Coop Tour, and am looking forward to building something new! The lappity-toppity was getting cranky, so I've done a low-level format of the drive and am re-installing everything from scratch. Hope to have some farm-related entries soon! It's not always fur & feathers around here. Spouse and I like to get out to eat once in awhile. Our usual is to find the best, most inexpensive "hole in the wall" joint for whatever cuisine strikes our fancy. No ambiance? Not a problem if the food is good; even better if they don't look askance at our dirty jeans and sneakers. Once in a blue moon, however, we'll take a shower (don't faint!) and hit a moderately pricey venue if there's a celebration or particular craving that only a certain type of restaurant can provide. One such restaurant introduced us to a dessert wine that was so good, I knew I had to go out and buy some for our personal stash. I wasn't willing to buy it through the restaurant, however, as wine markups in eateries are darn near criminal. Search though I did (and our friends, too), I was not able to find it locally. The few retailers we hit weren't able to find a supplier, either. Just now (as of, say, 10 minutes ago) finally teased the information out of the mighty Internet for Feudo Arancio "Hekate Passito" (Sicilia IGT) dessert wine. My Google-fu must have been lacking since last Spring, as I didn't realize that there was a resource on-line called Wine Searcher, and easy as pie, they came up with a list of retailers who will sell & ship the wine here in the USA. It's a bit spendy, so we won't be able to purchase too many of these bottles, but dang, it'll be worth it. This stuff was/is good. Look at those teeny, tiny tailfeathers! CUUUUUUTE! One of my favorite warm-weather work shirts had a tear that needed mending. Instead of doing the usual patch, decided to dust off the old embroidery skills. 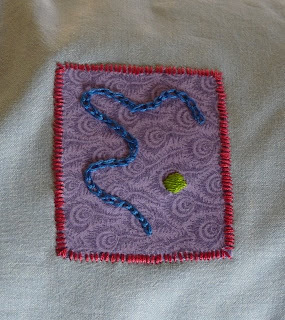 Mind you, I haven't embroidered since grade school, and I'll tell you now, my eyesight was MUCH better then than it is now. 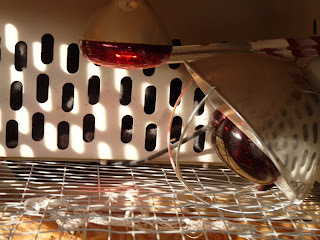 Broke down and got out the reading glasses so I could thread the @#$!! needle. Before the needlework, however, I got out the iron-on Stitch Witch and a small piece of cotton to cover the rend. Once the patch was ironed securely, got out the thread and started edging the patch. 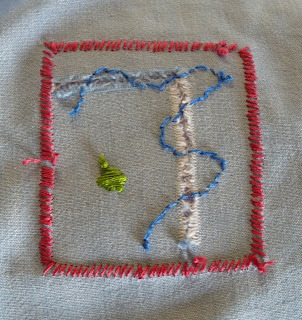 The patch looked a little bare in the middle, so I worked a squiggly line over the torn area to ensure it was kept closed, then added a little green dot. Nothing fancy, that's for sure. The work wasn't near as good as when I was a child - for instance, I forgot to "sew in" the knots in the back, and the back doesn't look very finished - but it was a fun thing to do. Now my old Cabela's chambray work shirt has a bit more personality than just stains and wear marks. D@mn, I'm getting all sorts of domestic... time to shrug it off and go frag some bad guys on City of Heroes. Eighteen chicks, to be exact. Just straight-shot rough videos, no editing or titles. First video was taken a couple days after we received the chicks, the next video is the chicks introduction to the wonders of fresh corn on the cob. Nummy! Hops, passionfruit, gojis, and additional herbs have been planted. Peppermint, aloe, and bay laurel trees have been potted. Front garden-bed rock "outline" has been re-established. A third of the front-yard "pasture" has been reseeded - another third tomorrow. 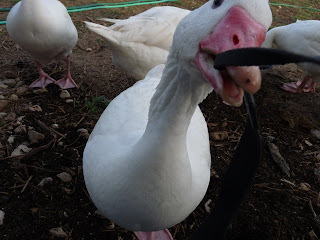 Broody Goose has been booted from the laying kennel - she was getting way too skinny and unkempt - and the opening blocked. No worries, there's other kennels, just blocked her favorite. 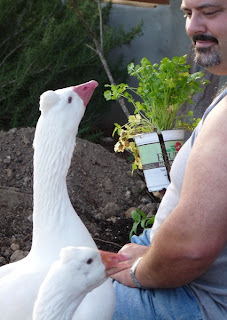 Rigged the chicken coop so the other goose can't lay in it (and thus keeping the chickens out). Cleaned up the property from the last wind storm. 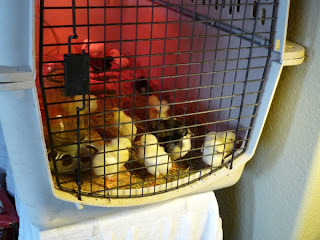 And last, but not least: moved the week-old chicks from the starter kennel into bigger digs. 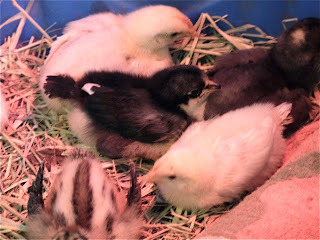 Good word, we're gonna have to build a bigger coop just to house them in a few weeks! Spouse: You won't let me -? And that's how the conversation went between Spouse and Godzilla the Gander for a good minute or so.